It seems more and more that customers have issues with drivers. Often it's a case that there is an old driver on the system and the new driver isn't overwriting properly. It's also nice to simply remove old, unwanted drivers that are no longer in use. 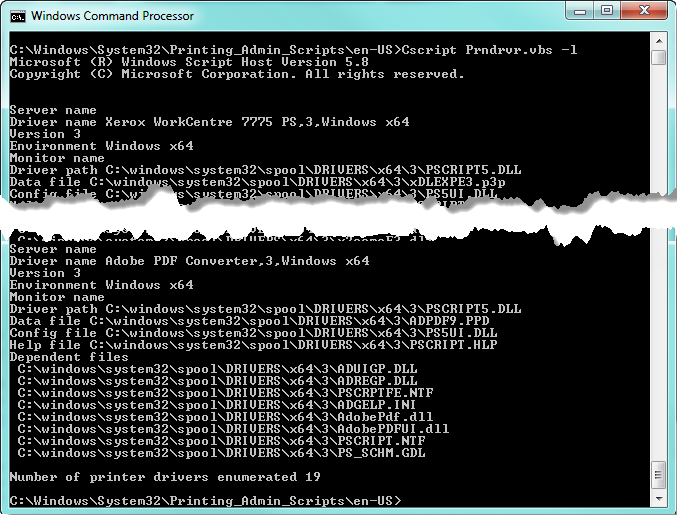 cscript prndrvr.vbs -d -m "drivername" -v "version" -e "environment"
cscript prndrvr.vbs -d -m "Xerox Phaser 6180MFP-D PCL 6,3" -v 3 -e "Windows x64"
NOTE: The driver cannot be currently in use, any printers assocated with this driver must be first deleted. Once the printer is removed you may need to restart the spooler (net stop spooler | net start spooler) to release the lock on the files. NOTE: Just like above, drivers will not be removed if they are in use. Remove all printers and restart the spooler (net stop spooler | net start spooler) then run this command. prndrvr.vbs can also be used to add drivers to the system. This is useful with prnmngr.vbs that can add printers via the command line. 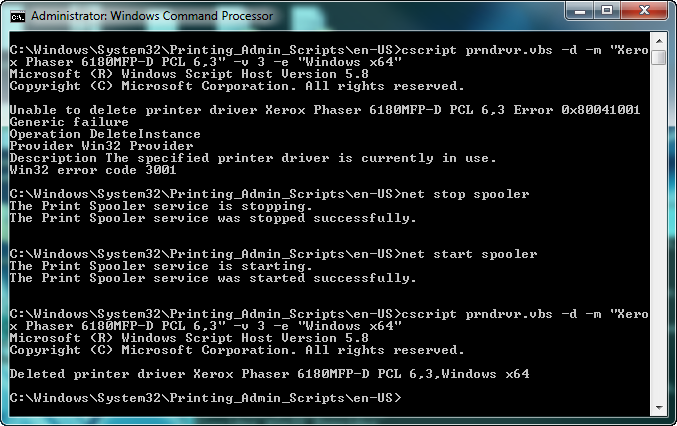 A script/batch file could be used to add the drivers and then install the printer. See the -a argument for adding drivers via prndrvr.vbs and the our related document on managing printers using prnmngr.vbs.